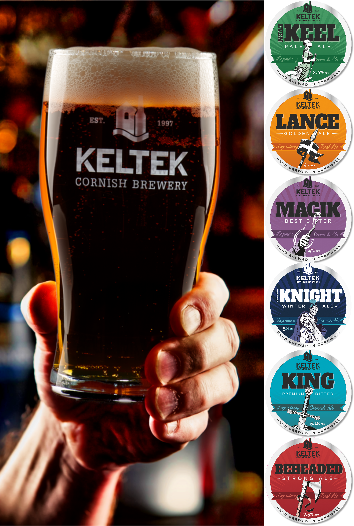 We serve Keltek’s range of Legendary Cornish ales, brewed less than a mile from the pub. 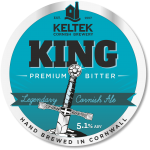 KELTEK King (5.1%) and Magik (4%) are our two regular real ales with Even Keel (3.4%), Beheaded (7.5%), Swifties Velvet Stout (5.5%) and Polgoon Penzance Scrumpy (7%) available on our hand pumps on an occasional basis with Swifties Dark Mild (3.2%) also on from time to time. From the keg we shall soon be introducing Swifties Cornish Pilsner – a premium locally brewed lager. We stock Keltek’s whole range of bottles to drink in or in take-away packs of 4, 8 or 12 bottles. 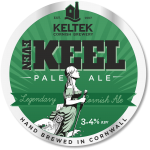 Discover more about the Keltek Cornish Brewery here. Keltek King 5.1% – premium bitter which is exceptionally well balanced and long-lasting on the palate. SIBA National Brewing Competition Champion Bottled Beer, ‘International World of Beer’ Festival (Miami) First Place Winner, and two South West Regional Gold Medals to name but some of this beer’s accolades. 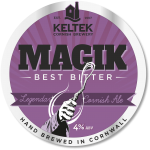 Magik 4.0% – the benchmark brew. A traditional, fruity best bitter full of hops and malt flavours with gentle bitterness. SIBA South West Champion Best Bitter and National finalist. Our most popular ale. Find out why Magik’s so popular – there’s a review on Youtube click here. 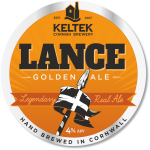 Lance 4.0% – A refreshing, easy-drinking golden ale, pale and fruity with a citrus bias. CAMRA Cornish Champion Ale. Even Keel 3.4% – A refreshing pale ale with a fruity yet malty first impression, followed by a hint of tangerine with gentle bitterness. Unusually long on the palate and full flavoured for a lower gravity beer. 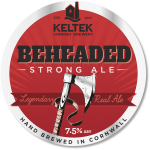 Beheaded 7.5% – Keltek’s strongest ale; dark and deceptive with a smooth, slightly sweet first impression and none of the alcoholic twang often associated with strong beers. Its complex, indulgent flavour is legendary. Click here to view an amusing review of Beheaded on Youtube.